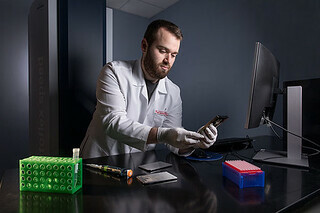 A National Science Foundation Graduate Fellow and Microbiology doctoral candidate, Matthew Powers is working to identify new treatments for the antibiotic resistant Gram-negative bacteria Acinetobacter baumannii. Unlike single-membrane Gram-positive bacteria which are susceptible to antibiotics, double-membraned Gram-negative bacteria are unaffected by many treatments due to the impermeability of the second, outer membrane. “The cell membrane is a critical barrier for cells to protect themselves from the environment, including toxic compounds,” Powers explains. Gram-negative bacteria are found in virtually all environments on Earth that support life, and include E. coli (Escherichia coli), Chlamydia (Chlamydia trachomatis), and bubonic plague (Yersinia pestis). A. baumannii is a Gram-negative bacterial pathogen frequently implicated in hospital-acquired infections. It also is incredibly adept at becoming resistant to commonly used antibiotics. The increasing rates of antibiotic resistance are particularly dangerous because, as Powers points out, it is leading many companies to stop research and development into new antibiotics. Powers is confident that his research into Gram-negative cell walls can provide much-needed information to enhance effective drug delivery into these drug-resistant bacteria. Advised by Dr. M. Stephen Trent, Powers recently completed a study published in the Proceedings of the National Academy of Sciences (PNAS) to understand how A. baumannii can survive and modify its membrane when it lacks lipid A, a typically essential component of the outer membrane. To do this, Powers used an evolution experiment which involved continually passaging bacteria that lack lipid A. Over time, the growth fitness of these bacteria significantly improved. He was then able to use genomic sequencing to figure out what had changed. After graduation, Powers intends to continue his research in an academic position.